Employers Brace for March Madness | Page 6 | Challenger, Gray & Christmas, Inc.
March Madness is just around the corner and employers across the nation are bracing for the inevitable drain on workplace productivity. While millions of preoccupied workers could cost their employers nearly $4 billion in the opening week of the annual men’s college basketball tournament, one firm warns that companies may want to think twice about trying to quash employee participation in office pools or other non-work activities related to the games. “We are approaching full employment across the country. In some metropolitan areas, the unemployment is well below the threshold where talent is readily available. In this environment, employers should be taking steps to increase engagement and loyalty, not find ways to crush morale and employee camaraderie,” said Andrew M. Challenger, vice president of global outplacement consultancy Challenger, Gray & Christmas, Inc. 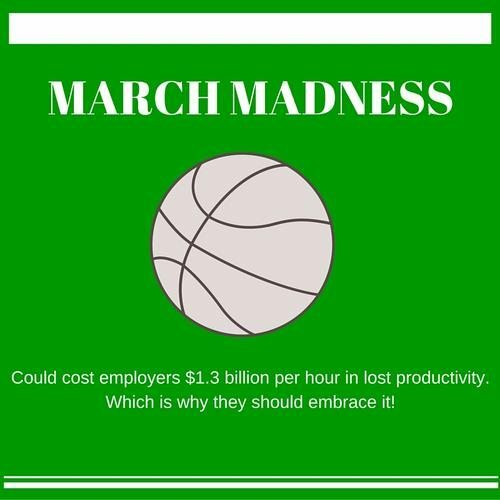 While some employed college basketball fans would like to downplay the March Madness impact on productivity, the fact is nearly 51 million American workers could participate in office pools this year. Last year, a Careerbuilder.com survey found that 15 percent of workers planned to participate in March Madness office pools. That was up from 11 percent in 2014. Based on that growth rate, Challenger, Gray & Christmas estimates that as many as 20 percent or 50.5 million of the 252.6 million employed Americans could join office pools this. With average hourly earnings of $25.35, according to the latest Bureau of Labor Statistics data, each hour of the workday wasted on building brackets or watching games will cost employers $1.3 billion. “Let’s conservatively assume that workers will spend at least one hour putting together their office pool brackets, and then at least two more hours streaming games during the workday on Thursday and Friday. That’s about $3.9 billion in lost wages paid to unproductive workers in the first week of the Tournament,” said Challenger. Workers will have more access than ever to March Madness games. NCAA March Madness Live, which allows fans to watch live streams of the games, will now be available across a record 12 platforms, including Amazon Fire TV, Apple TV, Roku players and Roku TVs, Amazon Fire tablets, iOS and Android mobile devices, Windows handsets, Web browsers, and the Apple Watch. Last year, March Madness Live generated several all-time records including 80.7 million live video streams and 17.8 million hours of live video consumption during this year’s tournament, according to NCAA.com. “When we started looking at the impact of March Madness on workplace productivity over a decade ago, brackets were filled out on paper and fans would actually have to leave the office to watch the games. About five years ago, fans with Internet connections at their desks could start watching games. Now, you don’t even need a desk. Anyone can watch from anywhere with a mobile device and decent data stream,” said Challenger. “The level of access is unprecedented, adding more fuel to the March Madness fire. It might be tempting for employers to try to beat back the flames by limiting access to streaming sites or banning office pools, but such a strategy will only backfire,” said Challenger. “Efforts to suppress the Madness would most likely result in long-term damage to employee morale, loyalty and engagement that would far outweigh any short-term benefit to productivity. “And, with labor markets getting tighter and tighter, employers would be better off embracing March Madness. For example, start a company-wide office pool that is free to enter and offers a free lunch or gift card for the winner. Or, allow workers to come to work during the tournament in apparel supporting their favorite college team (even if that team is not in the tournament). Employers may even want to consider setting up a television in a break room or conference room, so employees can check scores,” said Challenger.